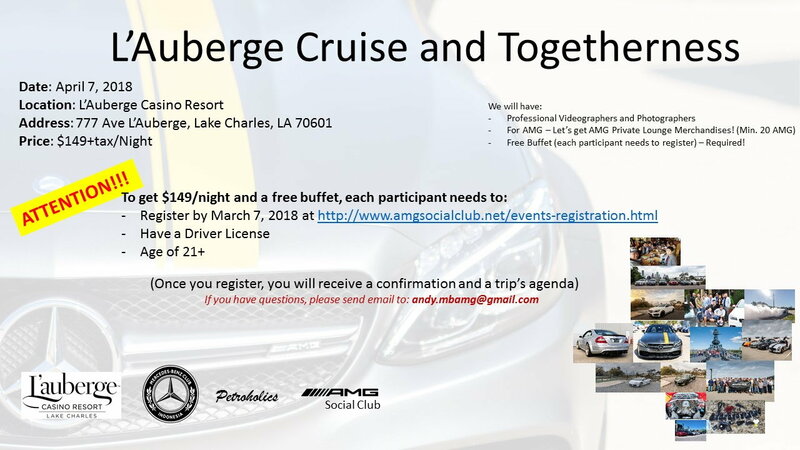 Let's get together at L'Auberge Resort. They offer us to stay 1 night on April 7, 2018, for $149/night + tax and free buffet (value $30 - $35 per person). It's a good deal! I've created a registration form for this event. Each participant who registers will get a free buffet (that's the only catch). The dateline is March 7, 2018. Once you register, you will receive the confirmation email and I will hand out the agenda 2 weeks before the cruise (we may stop here and there for video/photo). We will have a professional videographer and photographers for this cruise. Again, you will need to be 21+ and register to AMG Social Club website to get $149/night and a free buffet. The hotel required your driver license information. They will need 3 - 4 weeks to process this. For AMG drivers, I will need your AMG PL ID/Name/email. It will be easier for me to request their merchandises that way. They will need 2 - 3 weeks to process this. Let's do this! Let's get together again! and get to know new members as well. If you have any questions, send me email/text/call! A Reminder we have 1 more week left to register!